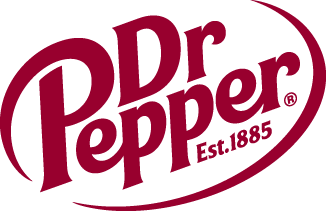 Dr Pepper Dallas Cup XXXIX Crowns First Four Champions of 2018 | Dallas Cup, Inc.
DALLAS, Texas (Saturday, Mar. 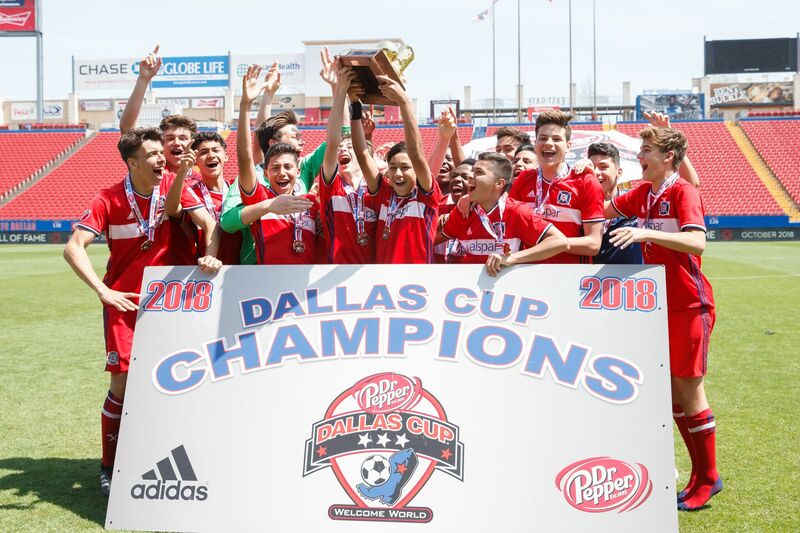 31) – The Dr Pepper Dallas Cup, the oldest and most prestigious international youth soccer tournament in the United States, kicked off “Championship Weekend” today at Toyota Stadium in Frisco and MoneyGram Soccer Park. The champions of the Under 13, Under 14, Univision Deportes Super 14s, and Under 15 divisions were decided with four teams hoisting “Boot and Ball” championship trophies. The marquee game of the day was the nationally televised Univision Deportes Super 14s final between Spain’s Real Oviedo and Mexico’s Tigres at Toyota Stadium. The much-anticipated international faceoff did not disappoint as both teams came out firing. On an early set-piece, Real Oviedo’s Pedro Saste headed the first goal past the Tigres keeper in the 4th minute. It was the first goal Tigres had allowed all tournament. The Mexican side equalized in the 10th minute after a rebound was laid off in front of goal and easily tapped in by Brayan Castillo to level the match at 1-1. In the 33rd minute, Castillo bagged his brace. Some strong play for Tigres down the wing led to a pass cut back across the box, where Castillo calmly tucked it away. The Spanish side continued to try and claw a goal back, but the stout Tigres defense held up until the final whistle with the final score 2-1. 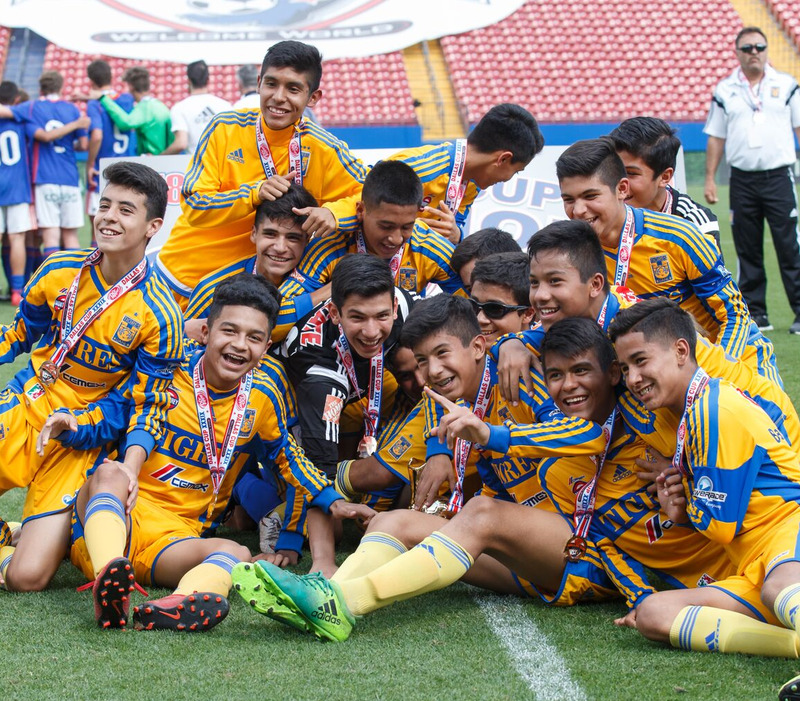 Tigres was crowned the inaugural champion of the Univision Deportes Super 14s division. The first match of the day was an epic battle between Lonestar SC out of Texas and Mexico’s Angeles Soccer Elite to decide the champion of the Under 14 age bracket. In the 7th minute, the Mexican side got the scoring going, after Daniel De Leon connected on a header from a corner-kick. In the 55th minute, captain Marcelo Assam tacked on a second goal for Angeles Soccer Elite with a gorgeous, far-post finish. The match was far from over, however. Victor Landin-Aviles pulled Lonestar SC within a goal in the 63rd minute, smashing the ball into the back of net from just outside the six-yard box. In stoppage time, the resilient Lonestar SC side put together a good bit of team-play and swung a cross into the box, connecting with the head of Josue Rodriguez to equalize the game at 2-2, and send the match into extra time. In the 6th minute of extra time, the Texan side picked up a beautiful half-volleyed goal from Ricardo Garcia to pull Lonestar SC ahead 3-2. Just minutes later, Angeles Soccer Elite answered back with a goal of their own by Bernardo Carmona. Kicks from the penalty spot were needed to determine a champion. 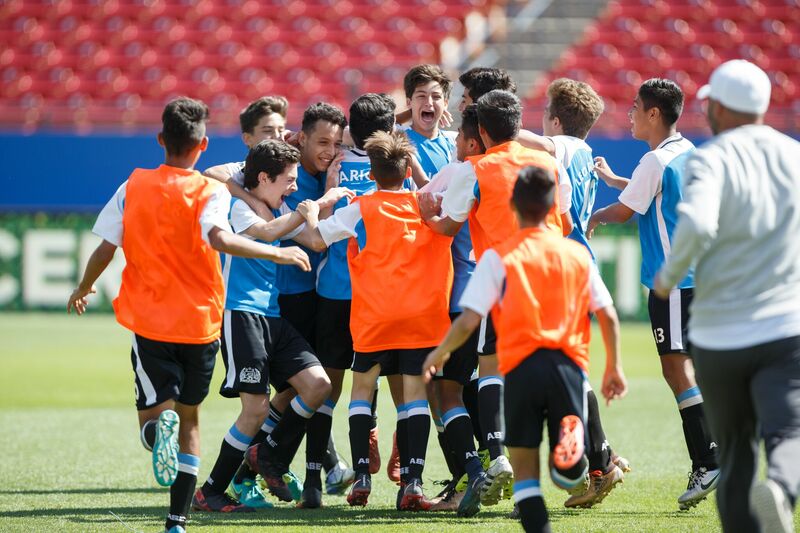 Angeles Soccer Elite’s keeper Santiago Perez-Meraz made two saves in the shootout, as the Mexican side was named the 2018 Dr Pepper Dallas Cup Under 14 Champion. The Under 15 final between Albion SC and Chicago Fire Academy kicked off at Toyota Stadium at 11:30am. The Chicago Fire got off to quick start after a deflection popped up in the box, finding the foot of Francisco Espinoza Jr. who curled the ball into the corner of the net on the volley in the 6th minute. Despite the MLS academy side creating several threatening opportunities in the Albion half, the match remained 1-0 until the 60th minute. Brian Gutierrez netted the second goal to put the Chicago Fire up 2-0. Albion SC was unable to break down the strong Chicago defense and the final whistle blew with the score at 2-0, crowning the Chicago Fire Academy Under 15 Dallas Cup champions. The Under 13 Championship between FC Dallas U13 Academy and Rayados McAllen took place at 4pm at MoneyGram Soccer Park. The all-Texas showdown got started with an early goal scored by FC Dallas’ Tarik Scott in the 2nd minute. FC Dallas’ Nolan Norris added a goal of his own in the 16th minute to give the local side a two-goal cushion. Just minutes later, Jordan Jones picked up a third goal for FC Dallas in the 20th minute. In the second half, FC Dallas continued to cruise, with Nighte Pickering and Kobi Thomas collecting goals in the 47th and 62nd minute, respectively. Nighte Pickering also scored in FC Dallas’ semi-final match played this morning. 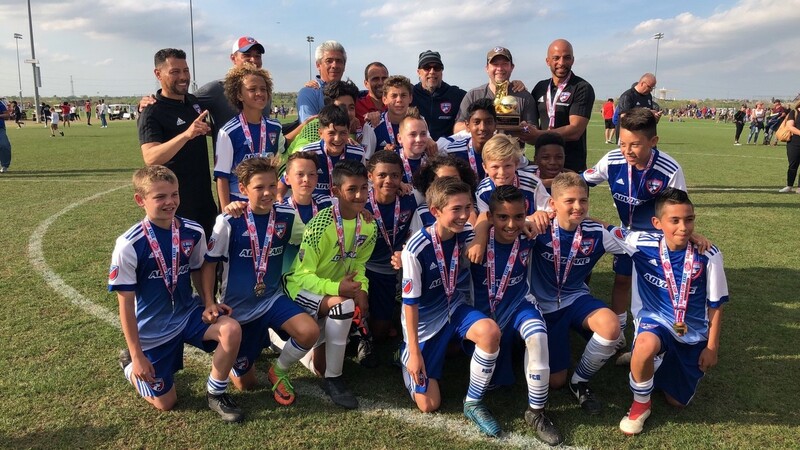 FC Dallas U13 Academy hoisted the “Boot and Ball” trophy following their 5-0 victory, winning the academy’s third Dallas Cup championship in the past two years. On Sunday, April 1, the champions of the U16, U17, U18, U19, and Gordon Jago Super Group will be determined. The Gordon Jago Super Group final is a nationally televised clash between the Premier League’s Arsenal FC and Liga MX side Tigres. Tickets are on sale now at www.dallascup.com.